Ultra High Definition, a.k.a. 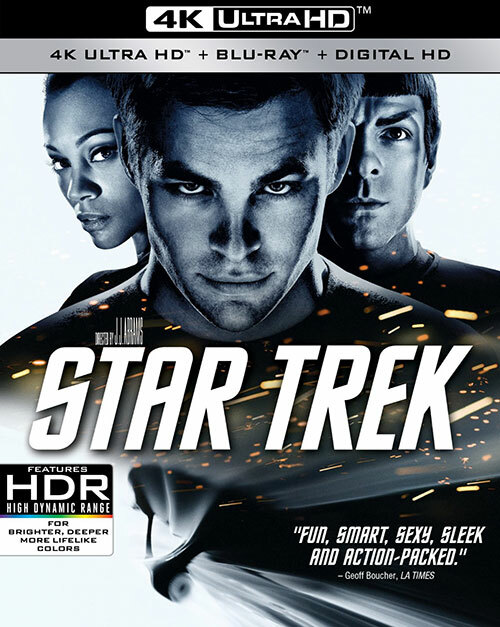 4K, programming is finally oozing its way into the consumer marketplace, and Paramount has jumped into the 4K disc market with the release of the first two Star Trek reboot titles - just in time to cross promote this year's new entry, Star Trek Beyond. I love 4K, but the dearth of software has meant there's been little incentive (other than the "gee whiz, look what I have" factor) for anyone to upgrade to the new video standard unless they're buying a new TV anyway. This is typical of any new format, of course; I remember when Superman was one of the few VHS/beta titles available back in the early days of the home video revolution, and 1080p high definition Blu-rays also trickled out slowly when they first hit about 10 years ago. Netflix has a few 4K offerings if you pay for their highest tier of service, and if you have the bandwidth, and TSN claims some 4K sports programming, though only, apparently, for Bell's Fibe and Rogers customers. There still aren't a lot of 4K disc-based titles trickling out from various studios, but Paramount picked the perfect pair of pictures to premiere its 4K discs. J. J. Abrams' Star Trek's breathed new life into the tired old franchise in 2009 and in my opinion it's one of - if not the - best of all the Trek movies. Sadly, they blew a lot of the good will that movie gave them, at least for me, with the 2013 follow up film, Star Trek Into Darkness, which started off great but veered, well, into darkness about half way through. It happens when we learn that the bad guy is just a rehash of Khan - and not even a better rehash, like Star Trek II The Wrath of Khan was to the original series' episode that inspired it. Still, Abrams' Star Trek and the first hour of Into Darkness are ripping yarns and Paramount's original Blu-ray releases of them were scrumptious. Needless to say, I was dying to see how they'd make the transition to 4K, and I'm very pleased with the result - especially, unfortunately, Into Darkness because it gives us the IMAX version with its gorgeous full screen scenes. "Star Trek" is basically an origin story. When we first met Kirk, Spock, McCoy and the rest of the gang, back in 1966, they were already a team and had been serving together for, well we don't know how long but they were already the proverbial well-oiled machine. Here, we see the same folk as they were when they were of Star Fleet Academy age and none of them were serving aboard a ship yet. Kirk wasn't even a cadet; he was a punk living in Iowa, a brilliant kid with a chip on his shoulder. Captain Christopher Pike (Bruce Greenwood) basically dares the young Kirk (Chris Pine) to enlist and when he does so he joins Spock (Zachary Quinto), McCoy (Karl Urban), Uhuru (Zoe Saldana) and the rest of the recast cast on a wild adventure that not only sends them off to defend Vulcan from attack by a renegade Romulan (Eric Bana), it also changes the Star Trek universe's timeline in a way that basically gave the producers carte blanche to come up with whatever good new ideas they wanted. Then they threw all that flexibility away in Into Darkness by rehashing the story of Khan. Oh, the new timeline made the story a bit different, but it certainly wasn't better than the "original" Star Trek II - which is considered one of the best of the Trek movies and the one that saved the franchise. It's a shame, because that first hour of Into Darkness is terrific! No need to rehash the plots excessively; I have a feeling anyone who wants to see a Star Trek movie will have seen these two already. The news here is the 4K transfers, and they're lovely indeed. The 1080p Blu-ray - which is also included in this three disc (4K, 1080p and "extras" - plus a digital copy download) set, was great in its own right - Abrams' infamous lens flares notwithstanding - but the 4K version ups the ante (as well it should!). Running the 4K and 1080p versions back to back revealed a noticeable increase in detail and colour with the 4K version - exactly as it should. Skin and textures are spectacular, especially but not exclusively in close up shots. In short, the image positively leaps off the screen! Audio is mixed into Dolby Atmos (which "dumbs itself down" to Dolby TrueHD 7.1) and it's at least as good as the original Blu-ray's Dolby TrueHD 5.1. Since my home theatre is "only" 5.1 I couldn't take advantage of the extra two rear channels, or the overhead Atmos stuff, but the soundtrack is still capable of immersing you in exquisite audio that'll give your equipment a good workout, including pinpoint location of sounds throughout the whole soundstage. Star Trek Into Darkness, as mentioned, is even better because it includes the IMAX version whose picture at key times leaps out of its regular, approximately 2.40:1 frame to fill the 16x9 TV's fully, with no letterboxing. There's about half an hour worth of this stuff, mostly big action and/or effects scenes, and they look fantastic in 4K. As with Star Trek, the 4K Into Darkness release contains both 4K and 1080p versions of the film, plus a third Blu-ray of extras (and a code for a digital download). Both the 4K and 1080p versions boast exquisite picture quality, but as with the first film, the 4K Into Darkness's is an eye popping eye opener. Fine details are spectacular (take a boo at the primitive aliens at the film's opening, whose faces look nearly 3D) and the colours are rich and deep and natural. The audio is also in Dolby Atmos and in my 5.1 home theatre it sounded fantastic, filling the room and putting you right into the action. It's great! Both titles are packed with extras, too, though if you've purchased earlier releases you'll have most of them already. Still, there's a lot of interesting stuff here. 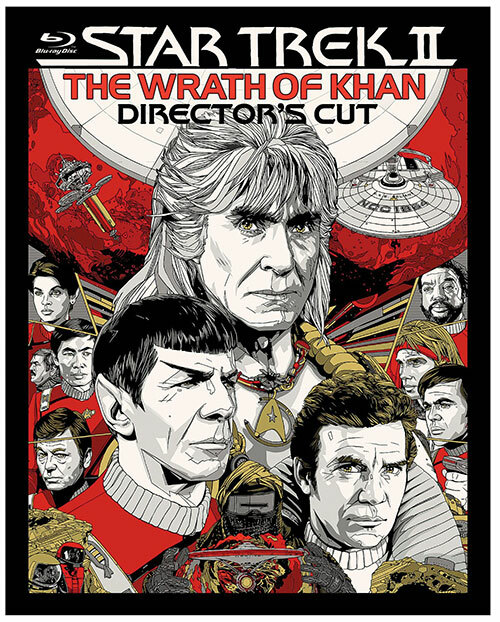 Paramount has also returned to the well with a new Blu-ray release of Star Trek II: the Wrath of Khan, arguably the best Trek film until the first of the reboots. This is a director's cut (you can watch either version from the main menu, however, which is nice) and includes about three minutes of outtakes that were originally left on the cutting room floor. It's ironic because in the supplements director Nicholas Meyer basically says his "director's version" was really the original theatrical one - and he's probably right because the new stuff adds nothing that's really worthwhile and, in fact, it slows the movie down a tad. You get a few extra shots that expand on a couple of scenes but overall I prefer the original version, which makes me glad you get both with this single disc re-release. This latest version could be a good purchase if you're one of what I imagine is a handful of Trekkies who have yet to have added this Blu-ray to your collection. And you'll get new box art for this release, though it makes the disc look like an animated version of the movie. The single disc is loaded with extras, too, including at least one new featurette. Picture quality is fine. It's on a par with the original Blu-ray release, perhaps a bit better, though it's by no means the best of the Trek films when it comes to picture quality (and this isn't 4K, remember, "just" 1080p); I remember ST V looking the best, even though it was the worst of the Trek movies (and doesn't that figure?). Audio, presented in Dolby TrueHD 7.1, is a tad shrill in places but considering the age of the film I'd say the overall presentation is fine. I'd love to see a new remastering and, Paramount being what it is, wouldn't be surprised to see it coming - perhaps for the inevitable 4K release, but in the meantime it's a very satisfying presentation of a very satisfying Star Trek adventure. Should you run out and purchase these titles? Well, if you don't have them already, or are planning to move up to 4K, I'd say they're good investments. If you do have them already, there isn't a lot here that's really new. Ditto for the Wrath of Khan, though at least it gives you the second version.